From the standpoint of various healthcare fields, the concept of material storage and handling is very important. Many people, when thinking of storage and handling, they tend to think about large warehouses and a lot of pallet racking. Although that’s certainly one aspect of material storage and handling, our storage options here at Felix Loeb can be used for an immense range of industries and applications. 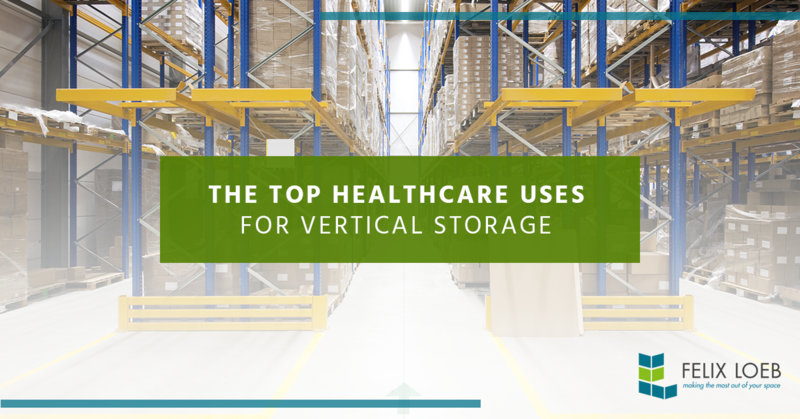 In this blog, we’re going to look specifically at the use of vertical storage in various healthcare industries. Vertical storage has the ability to save you 70 percent of your floor space and 60 percent storage capacity. The carousel system offered on many vertical storage systems offers immense flexibility in many different applications and keeps everything nice and organized. It’s not hard to see how useful vertical storage can be useful in pharmacies across the country. Pharmacies often have limited space to work with and certain medications need to be stored in a temperature controlled environment. Vertical storage can do both of these things at once creating a simple and organized system that allows them to access medication quickly. There are many administrative departments in various medical fields that would benefit from vertical storage. Hospitals, doctor’s offices, and dentists all need to keep track of hundreds of records for their patients and often have very little space to work with. Vertical storage can help to keep these records in a small area and easily accessible. When it comes to surgical supplies, keeping them sterile and easily accessible is of the utmost importance. In order to make this happen, surgeons need to be able to keep their supplies in a closed off environment, away from other employees and patients. Due to the compact nature of vertical storage, this is possible. And since vertical storage carousels are controlled remotely with a control device, surgeons will be able to limit access to these materials. Many patients don’t realize how much work goes into keeping medical facilities clean and sterile. Most of these medical facilities go through a thorough cleaning process that’s much more involved than what a janitor would do in an office building for example. As a result, cleaners need an organized system that allows them to keep track of clean and used clothing and other medical supplies. Vertical storage can be used for easy access to items so that patients aren’t kept waiting. Many of the vertical storage options we offer here at Felix Loeb are perfect for temperature-controlled rooms. Many businesses struggle to find the best material storage option for temperature-controlled environments because they know that the more space they are able to save, the more they will save on maintaining the temperature within the room. Just like with pharmacies, labs need to access materials quickly and efficiently. In a lab, employees spend a lot of their time looking for specific things and having a vertical carousel can provide them with a system that allows for that. Not only that, but laboratories often need temperature-controlled rooms as well. Vertical storage is a very useful tool in the field of material storage and handling. It’s become significantly more popular over the years as healthcare industries grow and develop and start introducing it into their practice. Although we specifically talked about healthcare fields in this blog, note that there are a variety of applications across many different types of industries. For example, auto shops often use vertical storage to store tires or car parts for easy access an to move materials that would otherwise be difficult with a normal standing platform. Felix Loeb are your material storage and handling experts in the Chicago area. We not only provide business owners with reliable storage materials for their warehouse, office, or medical facility, but we also offer consultative services to help you plan the best storage options allowing you to save space, time, and money. If you have any questions for us or you’re ready to get started, give us a call today.